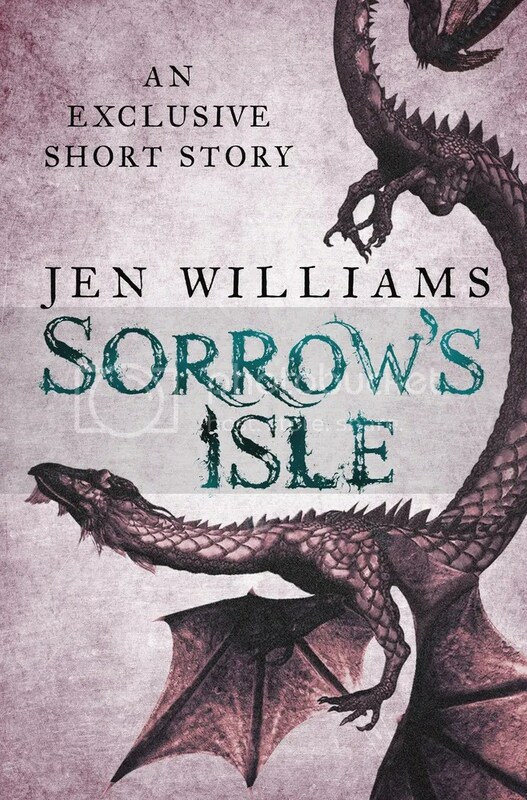 Jen Williams is one of a small, elite group of authors who’ve turned me round on fantasy fiction. Along with compatriots like Andrew Reid and Den Patrick she writes stories about refreshingly normal, flawed people faced with impossible situations. All three authors have a tremendous ear for a good bit of profanity, all three have excellent comic timing and all three have unique perspectives on the genre. I’ll be talking about Andrew and Den’s stuff later in the year, but Jen’s up first thanks to having two stories out in 2015. One, Sorrow’s Isle, is a prequel to The Copper Promise, her 2014 novel. The other, The Iron Ghost, is the sequel. Sorrow’s Isle follows Wydrin and Sebastian, two of her leads, on the first job they did together. It’s an interesting exercise, seeing them both inexperienced and without Frith, the splendidly grumpy third member of their cheerfully dysfunctional team. Wydrin’s swagger is very much in place but Sebastian is still smarting from the experiences that saw him exiled and that mournful tone runs through the entire story. A fairly simple retrieval mission, it takes in a possibly cursed island, a visit from the gods and a very gentle reminder for Wydrin of how far she’s already come. Jen excels at this sort of character work and there are moments encoded into this story that speak to Wydrin’s past and future, not necessarily in good ways either. It’s a welcome, foreboding note that ties the world of the novels together and it’s going to be interesting to re-read the novels, and story, in sequence next year when the third one comes out. So, Sorrow’s Isle is a quiet, dark little story about adventure and the price you pay for it. 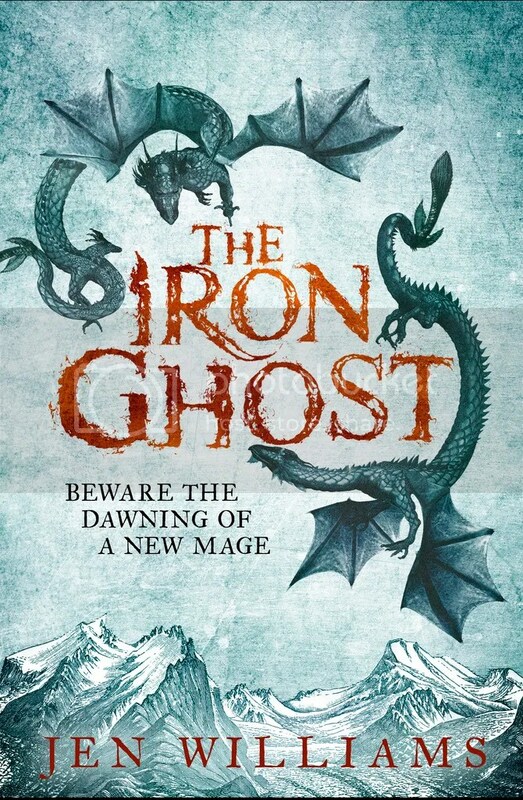 The Iron Ghost is a vast, exuberant story that shows the price is almost always worth paying. Wydrin, Sebastian and Frith are hired to retrieve the Heart-Stone, stolen from the frozen northern city of Skaldshollow by the Narhl. The Narhl are humans who’ve adapted to, and grown from, the frozen environment they live in. The people of Skaldshollow are humans who exploit their environment. The clash between nature and industry would be interesting enough by itself but Jen expands it out in two fascinating ways. The first is the way that conflict defines the two cultures. Skaldshollow is Silicon Valley under snow, a place of constant invention and innovation. The Narhl are, by contrast, like the mountain they worship; conservative. But in both cases the cultures take things to extremes; Skaldshollow is using the Heart-Stone, part of the mountain the Narhl believe is alive, to power their Werken automatons. The Narhl are entirely too fond of having an enemy to kick around and have no time for anyone, or anything, outsider their established society. Neither are wrong, neither is right enough and that sort of chewy, ambiguous conflict powers a good chunk of the book. For example, the glorious, Pacific Rim-esque closing scene is created by Skaldshollow’s feverish invention and the book’s most affecting plot is defined by the conservatism of the Narhl. One of the defining characteristics of the first book was Sebastian’s rage at being expelled from his order for being gay. That’s reversed here with Prince Dallen, heir to the Narhl throne. Again, a character is gay, again they’re ostracised for it but in this instance they have a readymade support network. Dallen is more comfortable in his skin than Sebastian was but he’s also not as used to being an outsider so the two men have a complex knot of experience and inexperience tying them together. How it’s dealt with, and the love they share for each other is Jen at her very best; compassionate, intelligent and often very funny. Wydrin, after all, sees everything. Aside from Frith of course. Wydrin’s always been the endlessly funny, swaggering heart of these books but this is the first time Jen’s not let her get away with anything. There are moments here where Wydrin is painfully honest with herself and those around her and they’re handled with immense compassion and openness. Wydrin and Frith clearly have feelings for each other, are clearly utterly incapable of coming at those feelings head on and the book ensures they have no choice but to do that. Their relationship is complex but there’s an undercurrent of fervent, desperate sweetness to it that comes to the fore here, at last. I look forward to seeing how they, not to mention Sebastian and Dallen, grow in the future. 751 words in and I’ve not even touched on the villains or Jen’s gleeful sense of invention. There’s strong connective tissue between this and The Copper Promise but never in a way that feels exclusionary. We see the aftermath of the Battle of Baneswatch and there’s a poignant sub plot following Sebastian as he tries to train the survivors. But the real genius of it is how the terrifying army from the previous book feel both individual and small here. Ranged against a deeply disturbing mage and a demonic scheme even they look outmatched and as a result there’s real tension to the closing fight. Plus Joah Demonsworn is a horrifically broken, deeply disturbing villain who poses a constant threat and leads to Wydrin doing something deeply heroic and very stupid. The heroes are on the back foot throughout here and that, along with the vast scale of the threat, means the final act crackles with tension. Not to mention spectacle. In the space of 400 pages Jen throws air to air combat with Wyverns, angry ghosts, cultural war, romance, comedy, sickening horror, an undersea heist and stone mecha combat at you. There’s not an idea left by the roadside, not a joke or a consequence that goes unexplored. This is fantasy fiction with the brakes off and Wydrin at the controls, laughing with the sheer, exuberant joy of it all. Even better, this never feels like another corner of the world that’s been hurriedly glued on. It’s clearly set in the same universe as the previous book but in a very different, and dangerous new area. Given that the first book involved the three of them getting into a fight with a god, that’s a hell of an achievement. Jen Williams is one of the best fantasy writers working today. These two stories, one short and sad, one long and fun, demonstrate that in every way. Start with Sorrow’s Isle, then The Copper Promise and finally The Iron Ghost. Wydrin, Sebastian and Frith are excellent company. Especially if you get a round in.